Ask Dr. Renee: Are You Still Going For Zero With Me And Omron? Are You Still Going For Zero With Me And Omron? 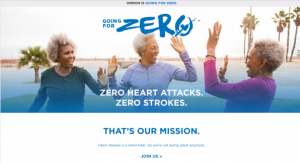 I have been on this challenge Going for Zero™ for awhile now and I must say I have learned some things from speaking to people about their blood pressures and health. I recently met a stroke survivor who was very young when she suffered a stroke. This tells me that no one is safe from heart attacks or strokes. In this post I want to talk about risk factors that you may or may not be aware of that could seriously increase your risk for a stroke and/or heart attack. Several types of heart disease are risk factors for stroke. Likewise, stroke is a risk factor for coronary heart disease. Coronary heart disease and stroke share many of the same risk factors such as high LDL (“bad”) cholesterol levels, low HDL (“good”) cholesterol levels, high blood pressure, smoking, diabetes, physical inactivity, and being overweight or obese. Individuals with coronary heart disease, angina, or who have had a heart attack due to atherosclerosis, have more than twice the risk of stroke than those who haven’t. If you have atherosclerosis in the coronary arteries you are very likely to have atherosclerosis in other parts of your body. According to the American Heart Association, “More research is needed to determine how stress contributes to heart disease — the leading killer of Americans. But stress may affect behaviors and factors that increase heart disease risk: high blood pressure and cholesterol levels, smoking, physical inactivity and overeating. Some people may choose to drink too much alcohol or smoke cigarettes to “manage” their chronic stress, however these habits can increase blood pressure and may damage artery walls. And your body’s response to stress may be a headache, back strain, or stomach pains. Stress can also zap your energy, wreak havoc on your sleep and make you feel cranky, forgetful and out of control. Medicines are helpful for many things, but usually not for stress. Some people take tranquilizers to calm them down immediately, but it’s far better in the long term to learn to manage your stress through relaxation or stress management techniques. Be careful not to confuse stress with anxiety. If you suffer from anxiety, speak with your doctor a treatment or management plan including whether you need medication. Figuring out how stress pushes your buttons is an important step in dealing with it. If your stress is nonstop, stress management classes can also help. Look for them at community colleges, rehab programs, in hospitals or by calling a therapist in your community.” Please consider purchasing an Omron blood pressure monitor, like the Omron EVOLV to monitor your blood pressure regularly. Please let me know how I can help you to decrease your risk factors for heart disease and stroke.